I’ve been a girly girl for most of my life. I started carrying around a purse when I was three, loved dressing up in fancy outfits for school dances and draping myself with my mom’s and aunt’s “treasures and jewelry.” When I came to the United States at nine, my proudest possession was my first real Barbie doll (they were hard to get in Poland), and I got my first “kid” make-up set at age ten complete with pink lipstick and neon blue and purple eyeshadows! I became obsessed with fashion at age eleven when a wiser friend explained to me the wonders of matching your leggings to your shirts “Red and pink don’t match, but purple and pink are a great combination. Bonus if you could get a coordinating scrunchy” (this was the 90’s of course). As time went on, I was on top of every suburban teen fashion trend (much to the amusement of my older brother), rocking grunge, gangster, punk, preppy, raver, retro, and hippie, sometimes within the same month! I loved reading beauty magazines and raiding the beauty aisles of the Walgreens where I worked as a pharmacy technician during high school, undergrad and pharmacy school as I worked towards getting my doctorate in pharmacy. By the time I was in my mid-twenties, I had caboodles of makeup, perfumes, lotions, hair styling products and every other type of beauty “enhancing” potion and lotion. I had dyed my hair numerous different colors, trying to determine whether blondes, brunettes or redheads had the most fun. After I finished pharmacy school, I even dabbled in cosmetic chemistry and was experimenting with creating my own highly effective (read: highly chemical) antiperspirant. I developed the formulation and experimented with raw ingredients in my apartment kitchen. My fiancé Michael, (now my husband) was in business school at the time and even wrote up a business plan for my antiperspirant. I never thought being a girly girl would be a detriment to my health until I started doing research for the “Toxins” chapter of my book Hashimoto’s: The Root Cause. This topic has been a sore subject for me, and I find it quite disgusting and upsetting to think about. Although I’ve covered it in great detail in my book, I often avoid the topic in interviews because it gets me so emotional and I always like to be level headed when I speak on a topic. In doing research for getting myself better from 2011-2013, I became engrossed in the subject of Hashimoto’s and didn’t have the time for my usual hobbies like shopping, or reading fashion magazines, while I struggled with new habits to get my health back. After I got my health back and my lifestyle changes became an effortless habit, I went back to my old hobbies… I looked through a fashion magazine and was appalled. It occurred to me that the beauty magazines are perfectly designed to make us feel inferior. Breakouts? Well, with skin like that, you’ll never be as happy as the models in our ads. But we do have lotions and potions that can help! Try this new acne cream/wash/pads. Oh, your skin is not as tan as the lovely model in the ad? Well, you’re not good enough, but we can fix that. Here, use a self-tanner and tinted moisturizer! Would you like to have those big doe eyes like the cover girl with the handsome boyfriend? Your eyes are too small, so you’re not as lovable. But if you use our eyeliner, mascara, and eyeshadow you might have a chance at finding love. While advertising tactics that make people feel inadequate are upsetting to many people, that’s only a part of the bigger problem. I understand how advertising works and that advertising can be educational and helpful in making people take action and changing something that they don’t know they need to fix. After all, I’m spreading awareness about symptoms (like dry skin, or lackluster hair, or weight gain) that could mean that our thyroid is out of balance and that we need to take better care of ourselves. And I am a big proponent of self-improvement, educating people about taking charge of their health and offering solutions for changing their diet and habits so that they are healthier and feel better. My problem with advertisements for mainstream personal care products is that the most items marketed to improve our outer appearance, actually diminish our inner health, and in the long run, hurt our outer appearance. 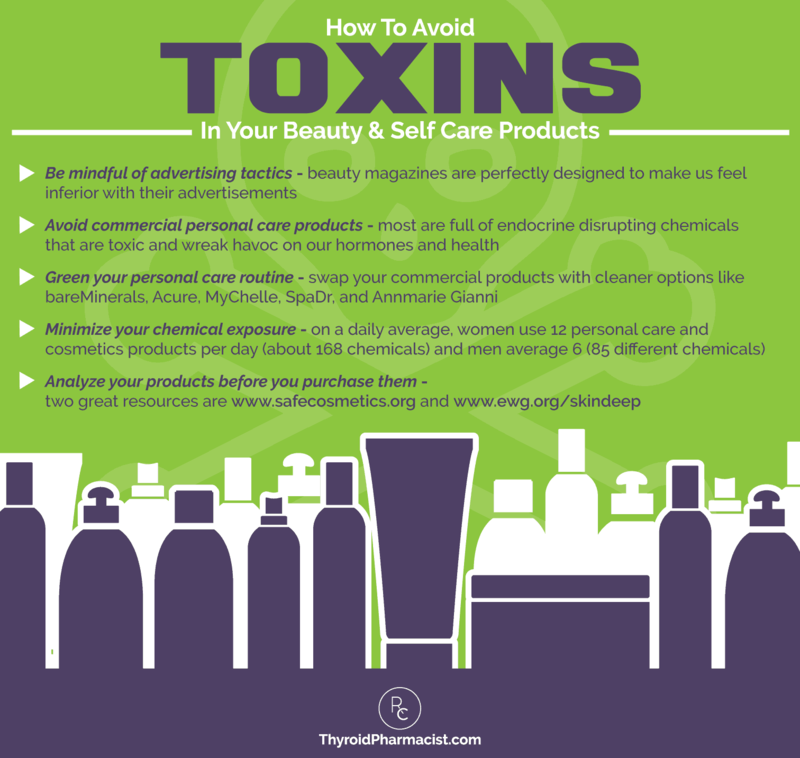 Most commercial personal products are full of endocrine disrupting chemicals that are toxic and wreak havoc on our hormones and health! I can’t go a week while browsing the news to find another article about skin issues clearing up when women dump their commercial personal care products. Skin issues like eczema, psoriasis, rosacea, dry skin improve, in some case drastically. Women, on average, use 12 personal care and cosmetics products per day, which amounts to 168 different chemical ingredients! In contrast, men use an average of 6 personal care products or an average of 85 different chemicals on a daily basis. 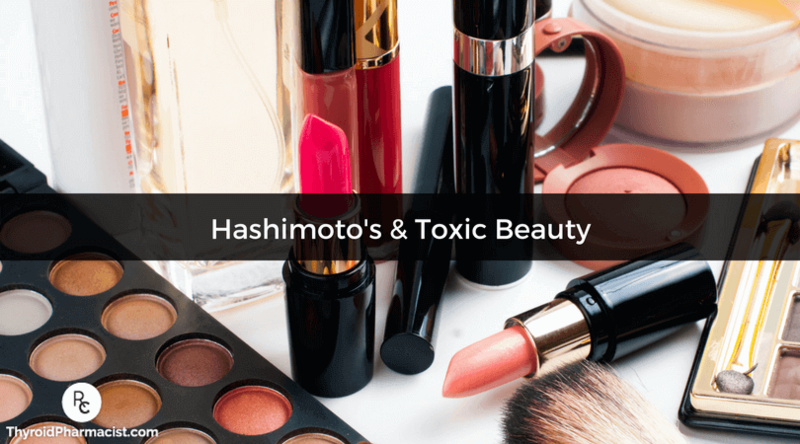 I suffered a flare-up of Hashimoto’s from makeup I used in 2014. I have toxicity labs and a 3rd party test to prove it. My symptoms started within 24 hours after beginning to use this particular product. I am not going to disclose the name of the product until I have more distance from the situation so I can act rationally, rather than emotionally, and until I’ve had a chance to consult with a legal adviser so that I don’t get sued by the manufacturer of the product. I will give you a hint: read this report. You can also check out the website http://www.safecosmetics.org/ or search http://www.ewg.org/skindeep/search.php to see how your products compare. You can search companies to see their overall rating, and also search for individual products. I try to use products with a 1 or 2 rating (lowest toxicity). EWG’s Skin Deep database is also available as a mobile app, so you can search while you shop. I’m also not going to go into the detail of the science behind how chemicals in our personal care products cause autoimmunity and thyroid dysfunction or go into detail as to which ingredients to avoid (I’ve already covered it in the updated version of Hashimoto’s: The Root Cause), perhaps I’ll write about them when inspiration strikes, but as I said, this is a difficult thing for me to write about so I may need some distance from it.. but I did want share some practical tips. Looking at my headshots on my website or videos I’ve made, you may be surprised to learn that I don’t wear make-up on a regular basis. Most days when I’m running around town, consulting, running my business, writing or doing voice interviews I don’t apply anything to my face. I feel that this gives my face some breathing room, and makes applying makeup a fun treat instead of a daily chore. Though I appreciate that I live in the real world where women are judged on appearance, so I do wear makeup when I am speaking in public on an important topic or when I attend a formal event (on average once a week). Women who wear makeup are perceived to be more professional, smarter and more put together. When I do wear makeup, I have a lot of fun with it and like to use brands that are as clean as possible. For foundation, I like Annmarie Gianni’s Minerals and bareMinerals. (I really like Annmarie Gianni’s sample pack that allows you to figure out your correct shade when shopping online). For eyeshadows, I like bareMinerals. My blush is from bareMinerals. Mascara and eyeliner from Physicians Formula Organic Wear Line. I wanted a shampoo that was gluten-free and free of the common harsh chemicals, but that also smelled nice and made my hair soft and shiny like some of the commercial shampoos and high-end salon shampoos. I’ve tried numerous shampoos from the internet and health food stores that just didn’t quite make the cut. Some of them made my hair look like straw, others didn’t seem to wash out, and I also had a brief trial with going “no poo” (using apple cider vinegar + baking soda), that made my hair feel like a pile of hay on top of a grease ball. I was really excited when I came across Acure at my Whole Foods Market (you can also buy online through links below). Their products are vegan, gluten and cruelty-free, and free of parabens, sulfate, silica, sodium chloride, phthalates, and synthetic fragrances. Additionally, they are color safe, smell nice and make my hair beautiful and shiny! My hair tends to be on the oily side, so I mostly use the Acure Organics Clarifying Shampoo along with the Acure Organics Conditioner or the Acure Lemongrass Leave-In Conditioner. Many people with Hashimoto’s may have hair that’s naturally dry and dull (mine used to be before I stabilized my thyroid), and for that, I love Acure Organics Moisturizing Shampoo and the Acure Organics Repair Conditioner. I will use this combination when I want to give my hair an extra boost of shine or when I want some deep conditioning (plus it smells beautiful!). For people with tangled hair (often a first symptom of an underactive thyroid), I recommend Acure Lemongrass Leave In Conditioner and the Tangle Teezer brush. These two together did wonders for me when my hair was tangled, and I still like to keep my brush with me at all times, especially when I travel! Body Wash: Dr. Bronner’s Shikakai Body Wash – Organic and free trade with natural ingredients! I love the scent, the lather and it also does triple duty for me as a hand soap and shaving cream. Lotions: I was always partial to scented lotions. However, most are full of toxic synthetic fragrances. I love Acure Organics body lotions which are free of toxins, are very moisturizing and have a lovely smell. Facial care: When I first was diagnosed with Hashimoto’s, I noticed that my skin became more dull and lackluster, and my dermatologist recommended the Clarisonic device, which I love and use to this day. This is a little exfoliating brush that uses gentle vibrations to remove the dead surface cells on our skin. I noticed an improvement in my skin’s texture immediately. For facial cleansers, I have liked MyChelle in the past and also enjoy the SpaDr line. Last year I also became obsessed with the whole Annmarie Gianni Skin Care line of moisturizers, creams, and cleansers! Formulated to even skin tone, reduce sun spots and make your skin look more vibrant. Made with researched skin repairing herbs. Cruelty-free and no animal testing. Truly natural, organic and wildcrafted ingredients. Aloe Herb Facial Cleanser – this feels luxurious, and my face feels remarkably clean after I use it. Coconut Honey Face Mask – this is a moisturizing mask I like to use once or twice a week. Partially because it makes my skin soft and dewy, partially because I like to lick it off my face. 🙂 It’s made with edible ingredients like honey and coconut oil! Their Herbal Facial Oil is a wonderful daily moisturizer, and it smells soft and lovely. I also really enjoy the Neroli Toning Mist to freshen up my face, and sometimes use it as a light perfume. Best of all, the company has put together 3 different sample kits (depending on your skin type) so you can get to know their line before you invest in a big package. It’s a great, low-risk chance to see if the products work for you. The kits are $10, but they’re shipped to you free, and you get a $10 off coupon for a future purchase. On top of that, if you get a sample kit you’ll also get their Skin Detox Guide (a $24.95 value) which is a complete ebook that shows you how to get bright, glowing skin (from within) and improve the health and beauty of your mind, body, and skin through food, facial exercises, tapping, affirmations, movement, and more. Kevin and Annmarie, the founders, gave me a discount to use for the Thyroid Bundle, and so many readers have written in that they love the product line and many of them are still using it almost a year later! We know that most perfumes have endocrine disrupting chemicals in them, and often, we’re applying them to our neck. I like to use nice smelling essential oils as a healthier alternative. For perfumes, you can mix a blend of essential oils that you like. I really enjoy the smell of frankincense, rose, and lavender, though everyone has their personal preferences. While I haven’t tested this personally, some of my friends and colleagues like Carrie Vitt swear by using essential oils like Frankincense, Clove, Myrrh, Marjoram, Basil, and Lemongrass to support thyroid function naturally. Jodi Cohen, a Hashimoto’s patient and Nutritional Therapy Practitioner, has also created her line of essential oil blends. My favorite scent is Circadian Rhythm, and she has also created a thyroid-specific blend along with many other wonderful blends. If you are not an oil connoisseur, you can purchase premade essential oil based natural perfumes like the Aura Cacia Chakra Roll-ons. The “Expressive Throat” Essential Oil smells like my high-end department store perfumes without the added toxins! In Eastern medicine, the Throat Chakra is connected to the thyroid gland, and suppressing your voice is thought to contribute to thyroid disorders. While I wouldn’t throw away your thyroid medications just yet, applying essential oils on the “Throat Chakra” is not just a healthier alternative to perfume, but also a great reminder to speak out and advocate for ourselves, whether that’s in day to day life or in our health pursuits, for example; “Wow, that gluten-filled pie looks lovely, but I’ll have to pass. This doesn’t work for me”, or “Wow, thanks for thinking of me for this project, but as I’m working on getting my health back, the added responsibility is not something I can handle”, or “No thanks, please don’t spray me with that perfume sample as I’m walking through the department store”. When I want to treat myself (usually 4-5 times a week), I like to take baths with Epsom Salts (1-2 cups per full bath tub) and add in some lavender essential oils or a Rejuvelle bath bomb. The Epsom Salts are a natural source of magnesium, and aid with relaxation, detoxification, pain relief and support the thyroid and adrenals (here’s my post on magnesium). Please note, I only recommend plain Epsom Salts, as the ones infused with scents and even essential oils can cause disruptions of vaginal flora when used in large quantities. These Rejuvelle bath bombs are a fun, fragrant treat to add to the tub, and they were created by parents of a daughter with an autoimmune skin condition and are gluten-free, made with organic materials, free of endocrine disruptors and dye-free. With the exception of Annmarie Gianni Skincare (which you have to buy online or in their Berkeley, CA shop), you can buy most of these products at your local health foods or Whole Foods, or if you’d like, you can buy many of them on Amazon. I’d love some feedback from you on your personal care products. How did the information in this post make you feel? Did you search out the ones you use in the database? Have you used any of the products I listed? What about your sunscreen, which one do you use? Bleaching product for the face, is there any without so much chemistry? Coconut oil is a wonderful sunscreen. It is natural and smells great. I am looking to change my skin care/beauty regimen to see if it helps my hashimoto’s. It’s just so overwhelming I don’t know where to begin. Do you have a starting point with the basics? Shampoo, conditioner, body wash, make up, lotion, sunscreen, etc? I literally feel like I am fighting for my life with this disease. Brittany – thank you for reaching out. I am so sorry you are struggling. I understand how hard it is. <3 Check out this link to my resources page and scroll down to the personal care products I recommend. Hashimoto’s is very much an individual condition. While there are root cause commonalities, each person will have their own or in some cases, more than one root cause. You will have to start with the simplest modifications, by removing triggers, followed by repairing the other broken systems to restore equilibrium, allowing the body to rebuild itself. You will need to dig down to why the immune system is imbalanced in the first place and this will tell you how you begin to finally feel better, reduce your thyroid antibodies and even take your condition into remission. If you need further support, please check out the list of lab tests inside the “Testing” chapter of my book, Hashimoto’s Root Cause. I also offer a 12-week program, Hashimoto’s Self Management Program. Here are some resources I hope you find helpful as well. I agree as well. I had no idea there was so many good afordable options. Vanessa – thank you for following this page. Here is a link to my resources page for information on the other persoanl care products I recommend. I have tried so many natural (and “natural”) hygiene and beauty products, my goodness! I’ve tried two Acure hair lines and initially loved the moisturizing line (Orange) as well, but eventually my hair stopped liking it. The green line (strengthening, I think) was terrible for my hair! I know no one with hair that tangles like mine. Now I’ve been using Andalou shine conditioner for quite a while and it is by FAR the best I’ve found. Smells wonderfully orangey, too. I’ve tried a handful of other Andalou products and generally they all seemed nice, and are rated pretty well on Ewg. Andalou Brightening BB Cream is by far the best aunscreen I’ve found; its zinc based, without the white cast. The best deodorant I’ve come across is EO brand spray- particularly the vetiver- or just straight lavender essential oil. I am no makeup pro, but I like the lipstick I got from 100% Pure. I wish people were more considerate with what they wear. I work around a lot of people, and one woman’s perfume can ruin my whole day. Hi – Love your site and agree with your recommendations on products. I use organic pure essential oils for a lot of things, including cleaning house and perfume. Another good idea is to make your own shampoos, conditioners and laundry soaps using essential oils and other simple ingredients often already in your home. For beauty products, though, easier to just purchase them so thank you for all your recommendations! What do you recommend for products that can change the color of our hair back to the color of our youth? Are there safe products for those of us that have gray color sprouting out and/or have much darker hair than when we were younger? Thanks! If you addressed this already, sorry but I didn’t see it. I would like to know which lip gloss you found that is not toxic. You were using a lip gloss at one time that was high in arsenic. I’m wondering if you found one that is not toxic. So thankful to be reading this invaluable information. I am an RN recently diagnosed with Haxhimotxicosis and still in the phase of trying to determine if my adrenals are also impacted. All my life I have promoted healthy/fresh eating and fitness. However, I have had much more to learn when it comes to other environmental/personal products. I am in the early process of pitching and detoxifying my home. I have your two books that are a godsend to my nutritional health and I am now starting to focus on the rest of the environment in which I live. I am ordering some of the items you have recommended above at this very moment and can’t wait to try them. I only wish I could locate a naturopathic physician in my local area that specializes in thyroid/glandular disorders. Can you offer a suggestion? Karren – thank you for following this page and for sharing. I strongly encourage you to keep looking until you find a skilled practitioner who can help you with Hashimoto’s, they are out there. Here is an article I wrote about my challenges finding Dr. Right. I’ve been using Suzanne Organics with a lot of luck. I had a broken out face for decades until I went chemical free with Suzanne Somes products and have clear skin for the first time ever. I would also like to know what you’re recommend for sunscreen. I have very light skin and have had skin cancer (my father too) so my integrative dr feels I should wear some sunscreen. Cynthia – while I haven’t done specific research on safe sunscreens, people with Hashimoto’s are very prone to sensitivity to harsh synthetic chemicals. I recommend natural products whenever possible to reduce the toxic burden on the body. I also love Acure! The first skincare brand that I could tolerate was DHC, it’s a Japanese company and not all of their products are hypoallergenic or skin-friendly, but the facial cleansers and soaps seem to be most gentle and hypoallergenic ones I’ve used. I use Jason’s body wash, it’s really good, I even cleanse my face with it sometimes. I tend to just use my own face oil as moisturizer, equal parts jojoba and rosehip seed oil- applied when I need it. Otherwise I don’t use lotion or products that much, I agree that nutrition and wellness is the most important factor in your skin and hair health. My makeup is definitely not that kind of “clean”, but I rarely wear it. I’m allergic to most eyeshadows and talc. Thank you Izabella for sharing your girly girl story. I was using the Acure products and loving them until I learned recently that glycerin can be a corn derivative, and I have a corn allergy. I called the company to verify and was told that the glycerin in their products is derived from corn so I had to stop using the shampoo, conditioner and body lotion.? I switched to a shampoo bar from Queen of the Meadow, and my daughter in law is making body lotion from all organic ingredients. I do miss the Acure as it made my hair feel great. Vernie – I’m sorry to hear that. Thank you for sharing your story and thank you for offering your own suggestions on what works for you! I am in my mid-50’s and have hypothyroidism that my endocrinologist thinks may be causing my high cholesterol levels. I eat a plantbased diet, no oils, very low processed sugars or other processed foods. I have no weight or other health issues but cannot bring my LDL cholesterol level down. I’ve searched over the years for products that work for my sensitive skin and am so happy to see that many are referenced here. I use Dr. Bronner’s almond or baby soaps, Acure fragrance free body lotion, and Acure Clarifying Shampoo and Conditioner. Each of those products works great for me! I use 100% Pure foundation, mascara, eye shadows and blush; One Love Organics face polish; and Indie Lee squalane oil as a facial moisturizer. I look forward to reviewing your other lists to see if those products are mentioned! Thank you! I’ve always been a bare minimum girl. I could never keep up with the latest trends. So subconsciously doing the right thing but still copped it ? but I would like to go lighter in hair colour. Without those orange turning lemon tricks, is the another way to do it, as naturally as possible? Thank you for the helpful info & recommendations. It does look from the EWG Skin Deep site that the newer formulations of bareMinerals are not ranked well, though. Have you seen these? I let my hair go gray at 42 because I was nervous about the chemicals in hair dye. Any recommendations for a good natural professional dye? I checked your resources section and could not find any? Judy – Thank you so much for your support! You can also check out the website http://www.safecosmetics.org/ or search http://www.ewg.org/skindeep/search.php to see how your products compare. You can search companies to see their overall rating, and also search for individual products. I try to use products with a 1 or 2 rating (lowest toxicity). Acure Argan shampoo turned my salt and pepper hair brassy blonde. My skin is mildly irritated most of the time now and I know it’s from non-organic products, though I have yet to start the elimination process. I don’t wear makeup because it’s impossible to find anything that doesn’t bother my skin. I can’t wear bareMinerals (I’ve tried it several times and, even though its ingredients are good, it makes my skin feel ‘burned’), and I’m reluctant to try anything that has ‘mineral’ in it. Can anyone please recommend another brand? Carol – thank you for reaching out. 🙂 Conventional cosmetics, potions, and lotions are filled with petroleum by-products, phthalates, formaldehyde, hormone disruptors and other toxins. As a pharmacologist, I’m well aware that what you put on your skin definitely gets absorbed into your body! I have a list of recommended personal, skin, and self-care products on my resources page here: https://thyroidpharmacist.com/resources. You can also check out the website http://www.safecosmetics.org/ or search http://www.ewg.org/skindeep/search.php to see how your products compare. Does anybody have any other recommendations for gray hair dye? Angela – thank you for following this page! Different hair dyes have varying levels harmful chemicals, even the safer ones can trigger symptoms. Depending on how sensitive you are some of the more natural ones may cause you less health issues but, I personally don’t feel great about recommending any on my page. I hope that is helpful. You can also check out the website http://www.safecosmetics.org/ or search http://www.ewg.org/skindeep/search.php to see how your products compare. You can search companies to see their overall rating, and also search for individual products. I try to use products with a 1 or 2 rating (lowest toxicity). Pacifica lipstick seems to have titanium dioxide in its ingredients. I read from different places that this is not a very healthy compound. Jenny – thank you for sharing. You can check out the website http://www.safecosmetics.org/ or search http://www.ewg.org/skindeep/search.php to see how your products compare. I am very sensitive to scents and I find it hard to find products that are healthy or healthier which are unscented. Even natural scents bother me. Any suggestions? Thanks so much for your work! Marion – thank you for reaching out. Here are some articles you might find helpful. I am in the process of ditching all toxic products and switching over to Pure Haven for everything! I love it, certified organic toxin free skin care, hair care, body care, home care, baby care and pet care!! I am not certain about organic soy in body lotions – and I am certain now not to purchase any product with any type of aluminum. Just in case! Thank you so much for this information.